“Just a few more steps,” I tell myself while dragging one foot in front of the other. I’m gasping, partly through exhaustion and partly through amazement. Juggling a fake Go-Pro (a cheap waterproof video camera on a selfie stick I nickname Go-Crow) and an iPad that keeps shutting down, probably through the cold, I press on to the next summit. And then another. And another. There are walls and then there are great walls. Sorry (not sorry) Donald. 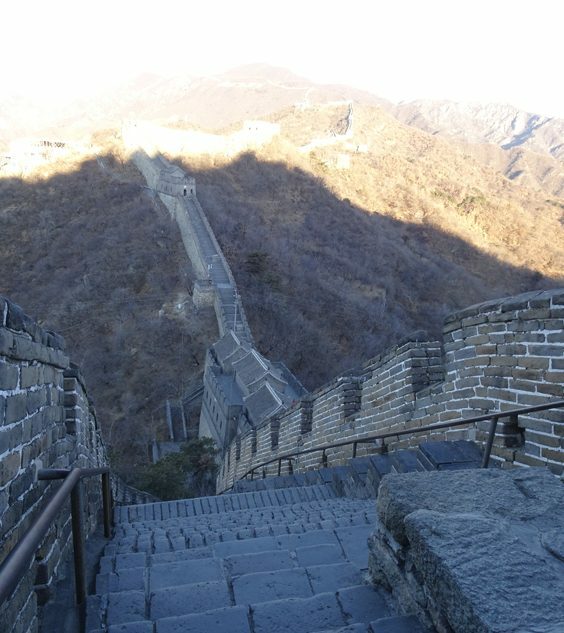 Not even the greatest bricklayers or Lego masters on earth can make your bonkers ‘vision’ a reality on a par with the Great Wall of China. Not unless you have centuries to play with. To put this in context, a day before I walked 10 miles around Sydney, so I’ve certainly had a great warm-up for this Sunday morning constitutional. Following an epic flight back to Blighty, I’ve stopped off in Beijing again for a flying visit to one of the wonders of the world. The first trip here two weeks earlier was a mix of annoying temporary visa application, tiresome passport control and a huge language barrier with our guide, and everyone else, as we explored Tiananmen Square, the Olympic village, the exterior of the forbidden city, and a marketplace filled with delicacies that made some exotic sci-fi movies look tame by comparison. 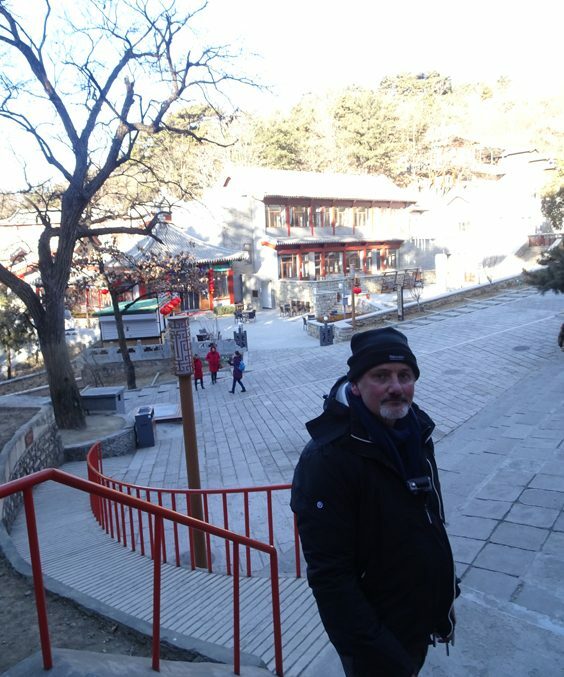 As amazing and disturbing as China is, with its epic architecture, vast wealth and poverty, the overriding feeling on my first trip was cold. It felt like icicles being injected into my legs as I explored the huge streets and bustling marketplaces. Being a Blade Runner fan, it also felt like the fantasy of big screen 2019 had become reality in Beijing. The only thing missing was the flying cars. Some of the locals certainly had that replicant quality: fresh faced-troops who looked like they’d stepped off a production line on one street and city-dwellers driving motorcycles with what look like oven gloves attached to the handlebars elsewhere. On this return visit in the real 2019, I’m armed with a plan: pyjama trousers under my waterproofs. It works like a dream. It took between 1500 and 2000 years to build the Great Wall, it contains the bodies of countless workers, and makes the beloved walls around York look like child’s play by comparison. This vast construction at times resembles an MC Escher optical illusion drawing: a wall that becomes a mountain of bricks. A mix of crazy angles to aid rain drainage, and the sort of almost troop-defying steps that underlined its military strength. I’m well aware that one false move could lead to a very bad day for me and Rachel. But thankfully we enjoy many an “Ooh” at the spectacle without too many “Aarghs”. I’ve saved a minute’s ‘Go-Crow’ footage from a two-week trek around Australia and New Zealand for something special, and having tottered around this phenomenal construction, I decide that tobogganing down the epic hillside is just the way to finish off the memory card. 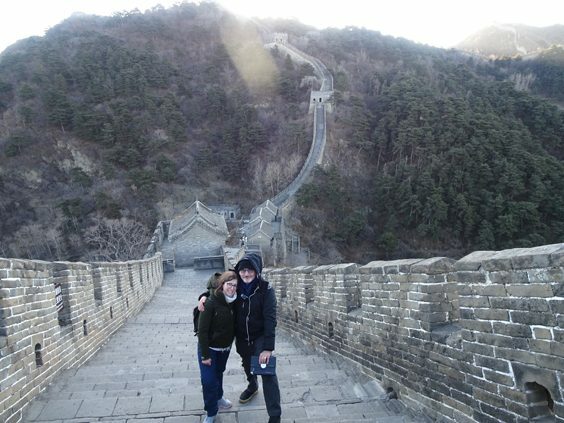 I’ll admit I had little desire to do the whole Great Wall experience, but thankfully Rachel has planned everything to the letter, so when we touch down in Beijing early Sunday morning and spend an hour applying for another temporary visa from a massively understaffed department, fear gives way to curiosity. 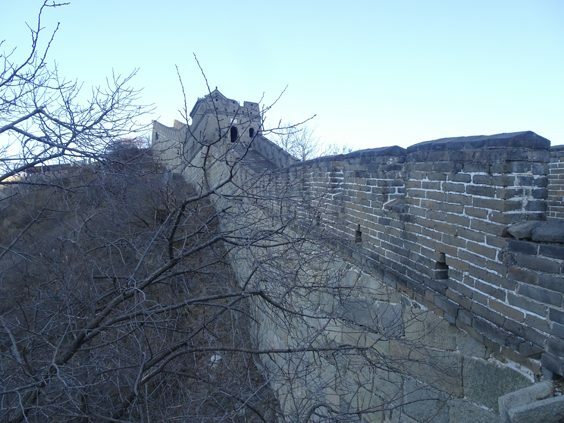 Thankfully this time our guide speaks fluent English, our driver could give Clarkson a run for his money on any track (essential for Beijing traffic), and an hour after setting off from the airport, we’re at the wall. A wall with graffiti scratched into its ancient bricks; names scrawled here and there. It’s like scribbling your name on the Mona Lisa. Thankfully we’re among the first to arrive, so the winter sun and loud tourists aren’t in our faces as we make our various ascents. As one of Yorkshire’s least fit men, I’m amazed how relatively ’easy’ the journey is. Yes, it’s cold, and juggling cameras is tricky, but being cooped up on an Air China flight for 10 hours from Australia means I’m ‘well rested’. That and the fact a fellow local traveller in his sixties or seventies makes the various ascents look like a child scaling a staircase. “Let’s go,” he smiles, way ahead of me as I watch him scale the almost vertical steps. I give him a round of applause and press on, counting off the steps in 10 and 15-step increments as my muscles wonder what on Earth I’m doing. Sorry lazy legs; this is one easy Sunday morning you won’t win. Bucket list and life goals hash tags are calling. That and a few hundred social media posts. After ascending via chair lift (where you literally jump on backwards before it mows you down, and jump off before it knocks you out), the descent via winding toboggan on S-shaped bends is a lot more fun and painful. If like me you suffer pain from hyper-extended legs (horse riding also creates an issue), then you might want to give it a miss. If not then put your accelerator lever forward, (braking occasionally) and enjoy. 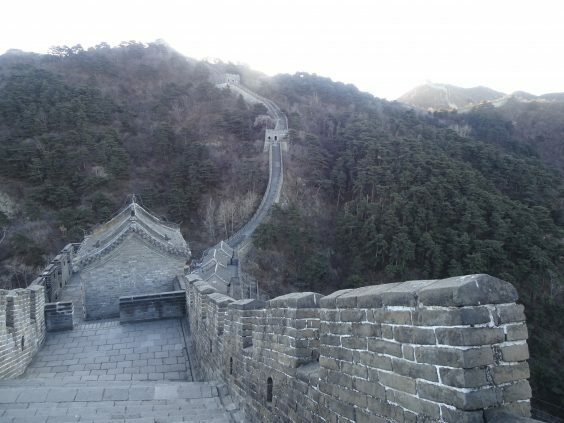 The Great Wall of China is an experience that redefines the word ’epic’. It’s a vast slice of history; a tribute to the countless souls who lost their lives in its construction, and 13,170 miles of jaw-dropping insanity. And the wall certainly does the latter. My take? Whatever gets you to your various summits, just keep putting one foot in front of the other, embrace the fear and be amazed by the result from the top.